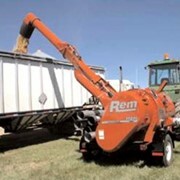 The Hutchinson Grain Pump is a continuous loop of chain conveyor and galvanized tubing encircling bins at the bottom and around the top, enabling the connection of many bins into one grain system, which can be selectively filled and emptied with ease. 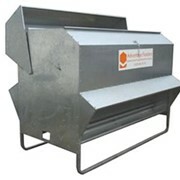 The grain moving mechanism consists of an encased chain and paddles, 2 horizontal runs, 2 vertical runs and 4 - 90° corners. The paddles are notched to facilitate the chain moving around the big sprockets in the corners within the system. 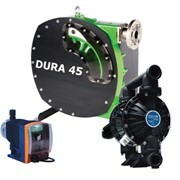 The Hutchinson Grain Pump is a totally enclosed and sealed system, the most innovative system made today. The chain and paddles in the Hutchinson Grain Pump move the grain en masse in the round conveying chamber, resulting in gentler grain handling and the consumption of less power to move the same amount of grain. 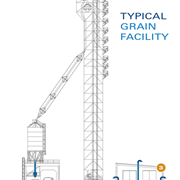 This arrangement facilitates a number of grain handling operations within a single system. Inload/outload, blending, turning, and offline functions are all easily accomplished with one simple system. 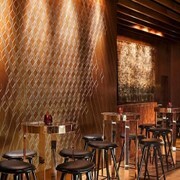 The systems modularity also provides for easy expansion as demands change. Because of the conveyor chain, the system must run in a straight line between the sprocket corners. Although a number of functions can be provided for, the straight-line requirement remains constant. The Pump can be installed vertically, in a new system, or may be installed on a slant, where pre-existing bins are being incorporated into an upgraded system. To see a variety of potential layouts, see the grain system layouts. 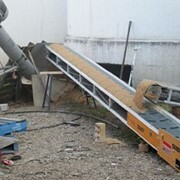 Grain exits the system through a manual or electric switch-controlled top discharge gate. 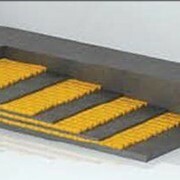 The function of top discharge gates is to change the direction of grain flow with minimal stress on the system. 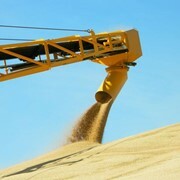 It slows the grain down as it is being directed into the bin or back to the truck at a 90° angle. At the bottom, material can be fed back into the system from bins through a hopper discharge transition mechanism. This promotes smooth, controlled grain flow, and avoids grain hang-up. The top discharge gate and the bottom hopper discharge transition are only two of a whole host of ways to get product into and out of the system. You can enter or exit the system with gravity from bins, trucks, spouts or by augers, chain conveyors, truck hoppers, and railcar loaders/unloaders, to name only a few. 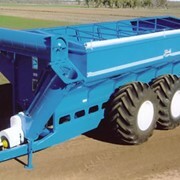 One or both top corners will have reducer drives with electric motors, depending on the length and height of the system. One bottom corner will be the inspection corner leaving one or two standard sprocket corners. 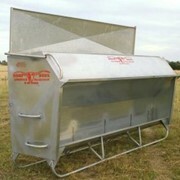 All components are galvanised steel or powder coated. 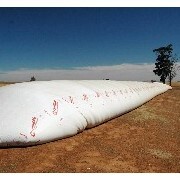 Allied Grain Systems Pty Ltd is an Australian owned company located in Young NSW. Allied Grain Systems are specialists in the design, supply and installation of grain silos and conveying systems throughout Australia. 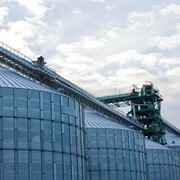 Services Offered include individual custom made designed grain storage and handling systems from initial conception to completion. This includes site visitation, consultation with the client to determine and understand their exact needs, preliminary design and costing, detailed design and costing, right through to supply and installation of equipment and commissioning. 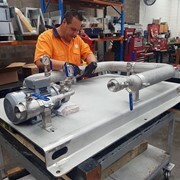 This design process offered also includes adaptation of new machinery and storage into existing infrastructure as well as working with the client to build a project in stages over a number of years. 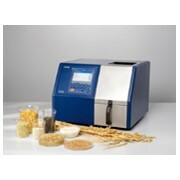 Mention IndustrySearch so Allied Grain Systems can best assist you! Get a callback from an expert at Allied Grain Systems to help answer your questions.